Your first visit will last approximately an hour. In this time, the osteopath will take a case history which includes taking detailed medical history and important information about your lifestyle and diet. Once the case history has been taken you will be asked, if required, to undress to your underwear (or if you prefer you can wear shorts) and asked to perform a series of simple movements to allow the osteopath to make a full diagnosis and an individual treatment plan. 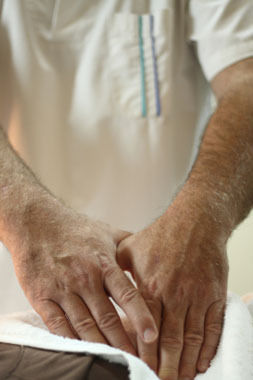 Treatment is through a range of stretching, mobilising and manipulative techniques. With added exercises and health advice, osteopaths help to reduce the symptoms and improve your health and quality of life. If additional treatments are required these usually last half an hour. Do ask questions at anytime during your consultation if you are unsure. No, however, if you wish to know more or are unsure if your complaint is suitable for osteopathic treatment please call and we can advise you on the appropriate treatment, whether that might be osteopathic or otherwise. I have suffered from a severe stress injury to both lower legs which was stopping me from training and affected my racing. Physiotherapy helped in the short term to alleviate some of the pain but I was referred to an Orthopaedic consultant who diagnosed an 'oedema of the right fibula associated with sub periosteal fluid, suggesting a significant stress injury'. Other than rest and pain killers, no immediate solution was provided. It was suggested that I see Paul Lewis, although I did not understand what he could do to help, I went along. I was very impressed with the treatment I received, especially the cranial therapy and I can now train and race without any pain in my legs. Thank you! Since our first tentative visit to Paul - quite some time ago now - we feel that we have discovered a young man who is not only sensitive to, and understanding of, our physical needs but who delivers his treatment with kindness and a gentle sense of humour. Regular visits to him have gone a long way towards enabling us to maintain our mobility as the advancing years have begun to take their toll and he has also been helpful in easing discomfort after "one-off aches and strains"! He will clearly state what he feels he can - or can not - do to help so does not prolong treatments and, therefore, un-necessary expense. A visit to discuss your specific requirements might be extraordinarily helpful, because his qualifications as a Registered Osteopath equip him to offer treatment for a surprising variety of conditions. We would recommend him most highly. Paul's approach includes both traditional joint manipulation and articulation (moving), muscle energy techniques (using the muscles to relax themselves), together with more gentle Cranial Osteopathic techniques, soft tissue massage and rhythmical movement techniques. Paul combines both classical and modern osteopathic approaches to health by treating patients as a whole and not just a collection of different body parts. Paul has a particular interest in treating breathing disorders and digestive problems. Paul is qualified and registered with the General Osteopathic Council.